So this series, the BabyLit series, is currently at 12 books and they explore the notion of using the classics as a primer for other things, counting or colouring for example. I received an email asking if I would like any for review and I was so intrigued I just had to say yes, and I am so glad I did because I want to give them a great shout out. The first book I read through, (quickly may I add) was the Dracula book. This is a primer for counting and, unfortunately for the book, I know my 123s and didn’t have a baby/toddler around to test this on (though I fully intend to keep these for when I do – and by the rest in the series!) but I thought it was brilliant. 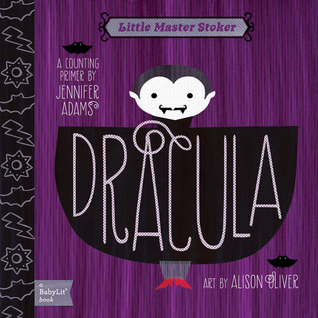 At first I was unsure because seriously who do you introduce a baby/toddler to the story of Dracula without terrifying it!? however as soon as I opened it I was amazed, the references within it make perfect sense to the original story and the illustrations are perfect, making the story a bit more cartoony for the child looking. I really loved some of the little touches like the addresses on the envelopes and the rats wearing ‘I <3 (in the shape of a bat) Transylvania tees. I love the idea of teaching my kid how to count using this book with its fantastic references and honestly it makes perfect sense for other people like me who love reading! Next up was Jabberwocky which is a nonsense primer, and every baby needs a bit of nonsense in their life! This was amazing and whilst obviously some bits of the poem were removed (like the actual slaying) there were some bits in there that I loved. The pairs version of the Bandersnatch is quite possibly the cutest I have ever seen and the other creatures were all amazing. I loved where they ended the poem with the embrace from the narrator to their son. The whole book was so bright and colourful that I couldn’t help but stare at the illustrations on each page, they did a brilliant job of it! The two books are both really sturdy board books which are bound to withstand any little hands – or teeth – getting hold of them. I can’t say how they faired with me as I obviously take care of my books and am not the appropriate age for it to matter but I can definitely tell they are built to last. The colours and the illustrations are perfect for little eyes and I can imagine they hold attention well. I can’t wait to have kids for numerous reasons but reading with them is one thing I am looking forward to and this series of books will definitely be high on the purchase list! The books were published through Gibbs Smith publishing and were sent to me in exchange for an honest review by the marketing people at the Publishers Group. For more info about the books please visit this page. There are also playsets, tote bags and buttons from the series available.